CHICAGO – Season Seven of Chicago’s Asian Pop-Up Cinema (APUC) is coming to a close on Wednesday, November 14th, 2018, with the Midwest Premiere of “One Cut of the Dead,” the Japanese horror sensation that is breaking box office records and cleaning up in award acclaim. The special night includes an appearance by lead actor Takayuki Hamatsu. The film will screen at the AMC River East 21 in Chicago, for details and tickets click here. A low-budget film crew about to shoot a zombie movie at a desolate warehouse is suddenly attacked by real zombies. The cruelly uncompromising director (Takayuki Hamatsu) forces his resilient producer, faithful male lead, and feisty ingénue to confront the living dead head-on for the sake of capturing it all in one shot, with no consideration for their lives. 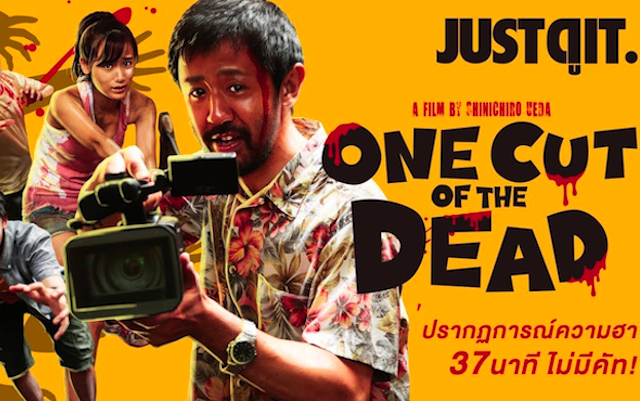 Purposely built on clichés, “One Cut of the Dead” is one of the most original genre-bending exploits in years, an exuberant homage that exudes pure passion for filmmaking. Season Seven of APUC – curated by founder and veteran film programmer Sophia Wong Boccio – celebrates its CLOSING NIGHT, in a season that highlighted films from South Korea, the Philippines, China, Thailand, India, Hong Kong, Japan, Tibet, Vietnam and Taiwan. APUC’s main presentations occur at the AMC River East 21 in downtown Chicago, with other various locations for special events, in addition to a number of free screenings. Season Seven of the Asian Pop-Up Cinema CLOSING NIGHT presents the Midwest Premiere of “One Cut of the Dead.” The November 14th, 2018, screening is at 7pm at the AMC River East 21, 322 East Illinois Street, Chicago. Lead actor Takayuki Hamatsu will make an appearance on behalf of the film. For a complete overview of Chicago’s Asian Pop-Up Cinema, click here.